Thallus: placodioid, 1.5-3.5 cm or more wide, 0.5-2 mm or more thick in center, primarily forming neat rosettes, but often either confluent or +dispersed and irregular, tightly to loosely attached; areolate to squamulose; prothallus: absent or vestigial, with the outermost edges and especially the extreme lobe tips often darkened blue-green to black areoles: contiguous or +scattered, irregularly +round, 0.5-1 mm wide; edges: sometimes raised and thickened lobes: radiating to randomly oriented, contiguous to discrete, 1.5-4.5(-6) mm long, 0.5-0.6(-1.5) mm wide, sometimes short and squamule-like, plane, concave, convex, or undulate with the edges folded along sinuses, but not sinuous-plicate; edges: plane or raised and thickened especially towards tips; simple to incised-crenate, the ultimate segments 0.3-1 mm wide upper surface: grayish yellow green to pale greenish yellow, grayish yellow, more yellow towards the lobe tips (in herbarium becoming medium yellow to pale brown or orange; coastal forms: often very pale yellowish green), continuous to rimose, +shiny or waxy; usually pruinose on margins (especially folded sinuses), or +spotily pruinose on warty areas near lobe tips (v. versicolor), or entire surface becoming +densely pruinose (e.g., albopulverulenta), esorediate upper cortex: cone cortex type, without dead algal cells, 50-75 µm or more thick, inspersed with yellowish granules (soluble in K, insoluble in N); hyphae: randomly oriented to anticlinal, 3-5 µm in diam. ; lumina: c. 2 µm wide; epinecral layer: 5-10(-15) µm thick medulla: solid but rather loose and cottony; algal layer: unevenly thickened and divided lower surface: white, or pale to deep yellow or brown, or at least partly blue-green to black lower cortex: mostly confined to areas near the tips or margins of the lobes, indistinct and poorly developed Apothecia: few to crowded towards thallus center, borne marginally or submarginally, one to several per areole, subimmersed then +broadly sessile, 0.8-1.8(-2.3) mm in diam. disc: often varying on the same thallus from light yellow to pale to dark yellow, orange- or red-brown or blackening or sometimes greenish gray near the margin, plane or sometimes convex, dull or shiny, epruinose margin: concolorous with thallus or pale yellow to pale orangish yellow, +raised then level with disc, 0.1-0.3 mm wide, dull or shiny, occasionally with thin white outer edge or thin black outer edge, sometimes +completely pruinose, entire to flexuous or crenate, finally excluded, often with a very distinct, +yellow to brown parathecial ring amphithecium: present, with an interrupted algal layer c. 50 µm thick located mostly next to the parathecium, sometimes with granules or a few coarse hyaline crystals (insoluble in K) in the medulla, corticate; cortex: similar in structure to that of thallus parathecium: hyaline, weakly differentiated from hypothecium, with conglutinated, thick-walled hyphae 3-5 µm wide and with narrow (1-2 µm) lumina epihymenium: inspersed with fine granules (soluble in K) hymenium: hyaline, 50-70 µm tall; paraphyses: tips thin and hyaline or pale brown; subhymenium: pale yellowish brown, 18-25(-50) µm; hypothecium: hyaline to pale yellow, 25-50 µm thick (to 150-300 µm thick in center or in areas where hyphal bundles extend into the algal layers), hyphae randomly oriented asci: clavate, 8-spored ascospores: hyaline, simple, +ellipsoid, 8-13(15) x (3.5-)4.5-7 µm Pycnidia: infrequent, scattered, and inconspicuous, immersed; conidiophores: type III of Vobis (1980) Spot tests: thallus (in the Sonoran region) usually K-, C-, KC-, P-; cortex usually KC+ yellow; medulla usually KC- Secondary metabolites: cortex with usnic acid, or occasionally (e.g., v. brunneola) isousnic acid; medulla almost always with zeorin, usually also leucotylin, other triterpenes, and fatty acids, and occasionally various depsides, depsidones or unknowns. Substrate and ecology: on basalt, pumice, rhyolite, granite, sandstone, and limestone; occasional on bark, in a wide range of communities World distribution: eurytemperate, subcosmopolitan in Europe, Asia, North America, South America, Africa, Macaronesia, Oceania, and Australasia Sonoran distribution: Arizona, southern California, Baja California, Baja California Sur, and Sonora, at 20-2800 m. Notes: As delimited here, Lecanora muralis is an extremely variable taxon, probably representing a complex of species. Some of the more distinctive variants in our region are var. brunneola (Mereschk.) B.D. Ryan & T.H. 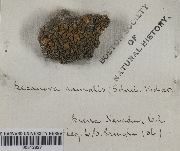 Nash, with brown thallus containing isousnic instead of or in addition to usnic acid (Arizona), and ssp. dubyi (Müll. Arg.) Poelt s. lato, with coarse, thick, often loosely attached lobes (widespread). There are a number of chemical variations, including a few populations lacking leucotylin; in Eurasia some of these chemical variations appear to correlate with morphological characters and have been named as separate specific or infraspecific taxa; much further study of these is needed before any of these names can be applied to North (or South) American material. 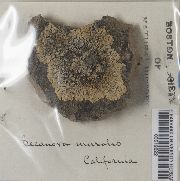 Material from Santa Catalina Island, collected in 1895 by Hasse, was referred to by Hasse (1903b) as var. catalinae Stizenb. (nomen nudum); examination of material in NY annotated as this taxon by Hasse shows that it fits well within typical var. muralis as delimited in the present treatment.